It is a relatively quiet to the end of the carnival for Ballymore although our two Flemington runners – Rhythm To Spare and Garud – are both in-form horses competing in two of the day’s major events. A horse always well regarded by the stable, Rhythm To Spare (pictured) just made it into the field for the $1 million Group One Emirates Stakes – and Michael Moroney is very pleased that he did. “We think he is a real lightweight chance,” he said, happy to have secured the services of Kerrin McEvoy. A somewhat unlucky third in the Sale Cup last time out – getting back on a track that suited the on-pacers, Rhythm To Spare was game in defeat having been so impressive saluting in easy fashion at Caulfield previously. Having raced over the Queensland winter carnival, it was always intended that Rhythm To Spare would have a light spring but we were keen to see him tried at Group One level. 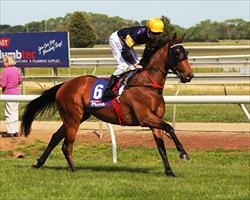 Yet to miss a placing in four starts at the mile of the Emirates, Rhythm To Spare jumps from barrier nine. Meanwhile in-form champion jockey Damien Oliver – undoubtedly still on a high on the back of his third Melbourne Cup victory – teams up with Garud in the $300,000 Queen Elizabeth Stakes. Pulling up well from his fifth in last Saturday’s Lexus, Garud has pleased us with his progress since – and Moroney was very happy with his last run. “He ran the fastest last 200m there and the extra 100m on Saturday is only going to help him,” he said.